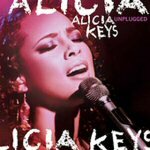 Honestly, there's nothing wrong with this CD of Alicia Keys' appearance on the revival of MTV's Unplugged series. The arrangements are nice and tight, the band is great, the guest appearances are good, and not especially plentiful. But there's nothing wonderfully magical about it either. Like the career of Alicia Keys, this record is right down the middle. I didn't like Songs in A Minor very much, past the pretty competent singles; she seemed like a nothingburger to me, a construct, a neo-soul kiddie decked out in Lauryn Hill's clothes (even copped a Grammy, just like Lauryn), stealing some thunder by semi-paraphrasing a Stevie Wonder album title. But I didn't hate it either, just kind of "eh". What I hated was her Grammy acceptance speeches, where she kept saying how "humbled" she was to get all these awards, when it was clear that she was not humbled at all. She was happy and lucky, and came off like someone who felt like she deserved and expected all the accolades she was getting. She does those singles, and they sound fine. She does "Fallin'", and it sounds great. She does a couple of new songs, and they're okay, although I really kind of hate "Unbreakable" and I don't know why, other than that it's a hooky pop piece but a poorly constructed song, condescending in its name-droppage ("We could fight like Ike and Tina / Or give back like Bill and Camille" [Cosby, in case you didn't know]), and completely uninspired. Plus, as long as we're name-dropping, don't you think you'd NOT want to be praising the parenting strategies of the Jackson family? Or throw around the names of broken-up couples in a song that claims "Our love is unbreakable"? She covers a couple of interesting tunes here. We all know that she loves to cover Prince's "How Come You Don't Call Me Anymore", which is done exactly the way you've heard it before, except with some audience-fluffing conversation that sounds like she's reading it off a cue card. But I actually love the version of the Rolling Stones' "Wild Horses" that Keys does with Maroon 5's Adam Levine. You wouldn't think this would work at all, but it does, pretty handily, because Levine has soul and Keys lets hers show. Also, they do a nice little key change at the end of every chorus that turns it from a country-rock song into an R&B song, pretty canny there. It's not the only time here when we see Keys come alive. She has a pretty voice, and she lets it fly on old favorites "A Woman's Worth" and "You Don't Know My Name" (which I love); the arrangement of "Streets of New York (City Life)" is fairly ambitious and weird; her piano playing is lovely as always. I even like the corny closing medley of "Love It or Leave It Alone", which features pretty good contributions from Common and Mos Def... but mostly because Damian "Jr. Gong" Marley comes out and they segue into "Welcome to Jamrock". But the posturing! It is obviously important for her to sound down with the streets; I can understand this, and accept it to a certain extent -- I've done the same thing. But hearing Keys, whose excellent diction is well-documented, faux-gangsteristically slurring " 'Atshright, 'atshright" to urge on her band, on two different tracks, is just depressing. And watching her go all hip-hop on the DVD of this concert is strange, because she's just trying SO HARD to urge on the crowd that she doesn't understand that they are already into it . But you know what? I'm cutting her slack on this, because she's a young performer. I just think her talent will take her a long way without her needing to be the baddest chick in the room, who just happens to be a classically trained pianist who has been relentlessly groomed for fame since she was young. I wonder what she'll be like when she finds out who she really wants to be. In the meantime, we have this record. It's great if you like her, not so great if you don't, and right down the middle for everyone else. The end.